Windows 8 pre beta release version is out foe download & Microsoft says that millions of downloads are taking place. Yes Windows 8 seems like a brilliant operating system and the new Metro UI interface will take time to become popular and widely accepted by users. The current version of Windows 8 does not have an easy way to shutdown a Windows 8 computer and yes there is a command line shortcut to shutdown any computer including other windows versions such as Windows 7, etc. 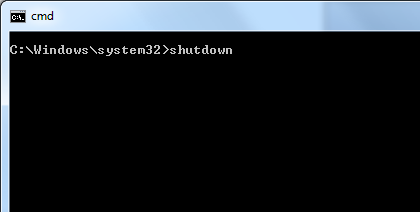 In order to view the available options to shutdown host windows 8 computer or even windows 8 network computers, you can view the command line options using the shutdown command as given below. Once you are happy with the shutdown command line parameters, you can create a desktop shortcut to shutdown your windows 8 computer. In case you simply want a desktop shortcut to shutdown your Windows 8 computer with easy to understand options, you can download the Easy Shutdown Software & use it to create a Desktop Shortcut to Shutdown a Windows 8 or any other Windows Computer. 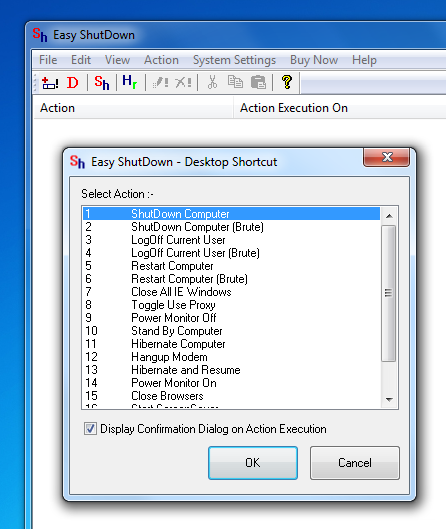 Given below screenshot displays how easy and quick is to create a Shutdown Windows 8 shortcut on your desktop. Whether you want a traditional shutdown of your computer or a forced / brute shutdown of your windows 8 computer, the software presented below has really easy options to shutdown windows 8. The Shutdown Shortcut when invoked will display a confirmation box for 15 seconds after which windows 8 shutdown will be initiated. In case you have opted for normal shutdown shortcut, then all the software applications with unsaved data must be closed before shutting down the windows 8 computer. However if you have opted for Brute Shutdown, then when you launch the shortcut, the shutting down of windows 8 computer will start really fast, will ignore any unsaved data on your computer and will shutdown your windows 8 computer as fast as possible. In case you have not downloaded the Windows 8 & you do want to try out this brand new operating system from Microsoft, go ahead and download windows 8 now, install it and test your software applications on this new operating system. Alternatively you can have a look at Windows 8 ScreenShots including a screenshot displaying Windows 8 Desktop on which there is no option to shutdown the computer.